Hi, my name is Dani and I’m a Smoothie-Aholic. 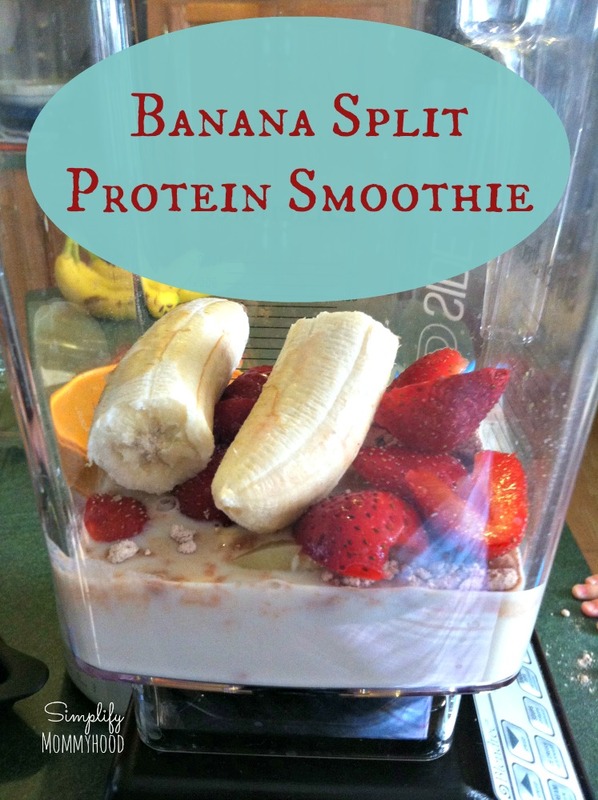 This is a favorite smoothie flavor for both my kids and my hubby. We make it at least once a week. To keep things simple, I freeze all of the fruit and keep them in mason jars in the fridge. In the morning, all I have to do is dump in the milk, protein powder and jar of fruit and hit blend! Anyway, on to the important part! Note: If you have a good blender, freeze the fruit first. If your blender can’t quite handle that, add about 6 ice cubes. 31 Days of Smoothies with Sara Howe. Smoothies!! This looks yummy! One of our favorites is strawberries, grapes…if you have vanilla protein powder…or vanilla yogurt….with a little milk. We usually throw in some kale or spinach but it is spectacular without the green as well. We are also found of banana and pineapple with the afore mentioned ingredients. We love those, too! Around here we tend to do a protein smoothie for breakfast (me and hubs) and a green smoothie for afternoon snack (me and the kids). I keep a lot of fruit in the freezer so we can switch it up. I’m still not a huge fan of kale though. Hi, what can I do instead of Almond Milk? I am new at smoothies, I can honestly say I have never made one and I’d like to start making some for my daughter before school. Hi, Heidi! 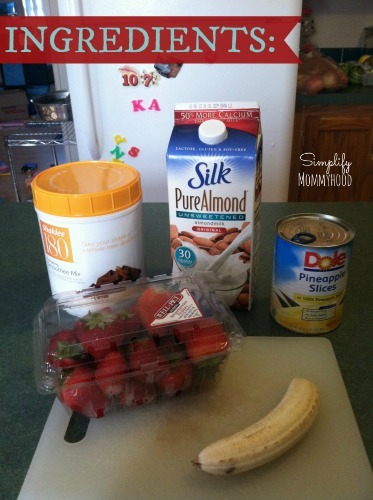 There are so many options to use instead of almond milk! Other nut milks are always an option, but we typically have coconut milk in the fridge and will use it. If no one is sensitive to dairy, you can absolutely use regular cow’s milk. For green smoothies, we use filtered water, coconut water, or very occasionally juice (usually apple or orange–the no sugar added kind). How much protein would u say this milkshake contains ? It really depends on what protein powder you’re using. I actually use a different one than listed here now, so my shake easily has 20g of protein in it. It makes approximately two 8oz servings, if I remember correctly.